Some friends of ours (from Ethiopia!) invited us to spend the afternoon with them today at the Dallas Arboretum. 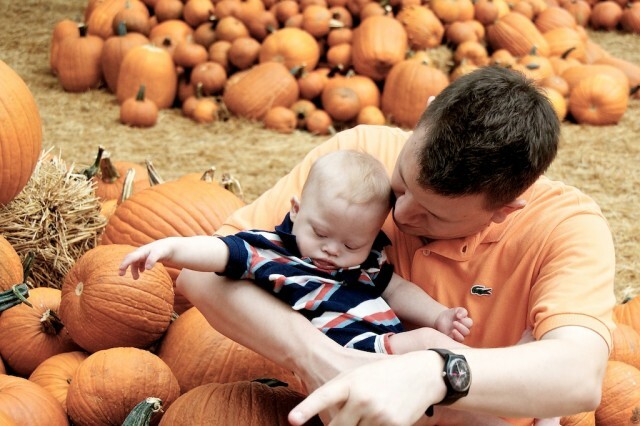 Every fall the Arboretum hosts the “Great Pumpkin Festival,” which is basically just what it sounds like. Pumpkins. 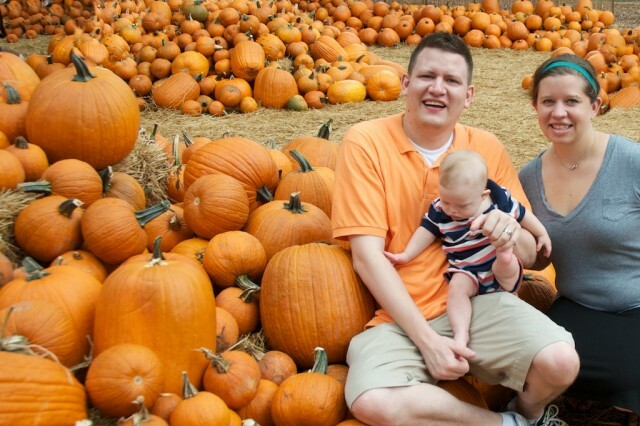 Lots, and lots of pumpkins! 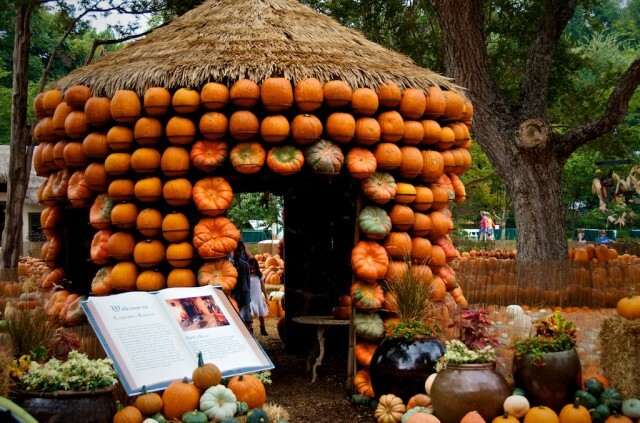 In fact in addition to pumpkins stacked to the sky everywhere you looked, they had four classic storybook houses built entirely from pumpkins like the one below. I could make one nice pumpkin pie out of this castle! I don’t even want to think about how long it took to construct all of the different pumpkin castles on display throughout the arboretum. Yikes! 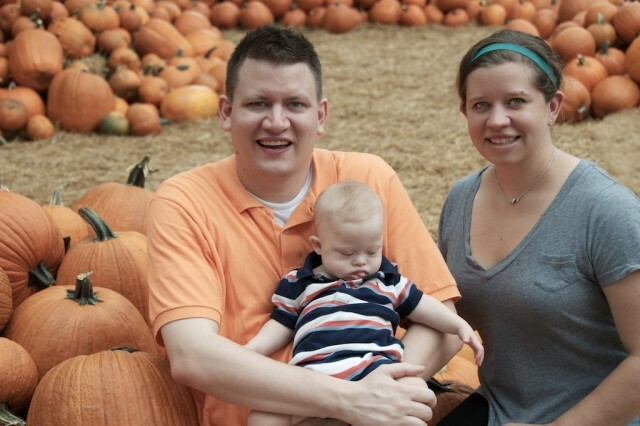 I think baby Noah wants some pumpkin pie! 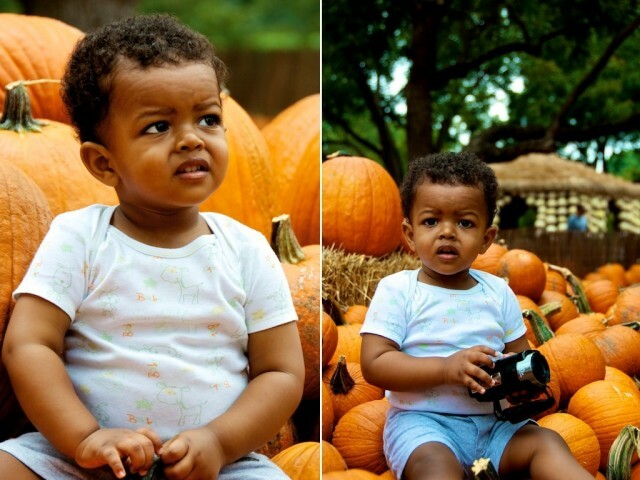 Ebenezer really enjoyed the pumpkins though! 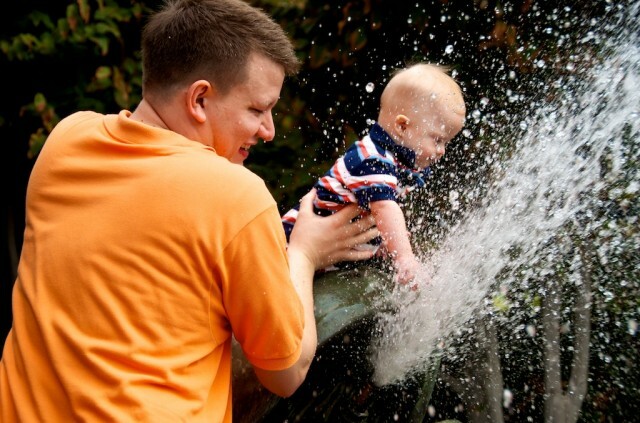 As we were walking around we found this fun frog that sprayed water out of its mouth…so being the wacky dad that I am I decided to let baby Noah play on it…..turns out he liked it…a lot! It was so much fun watching the joy on Noah’s face as he splashed around in the water. 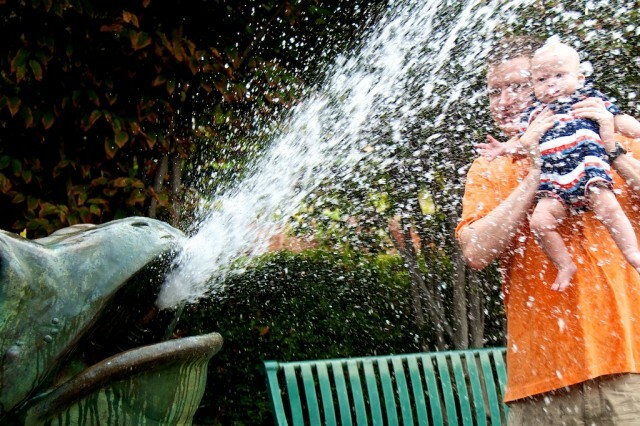 And yes, I’m aware that the videos and pictures of him sitting on the frog with the water spraying out look sort of funny; my wife and I are just waiting for all the creative comments about it. 🙂 But hey, he had lots of fun….and that’s what counts! 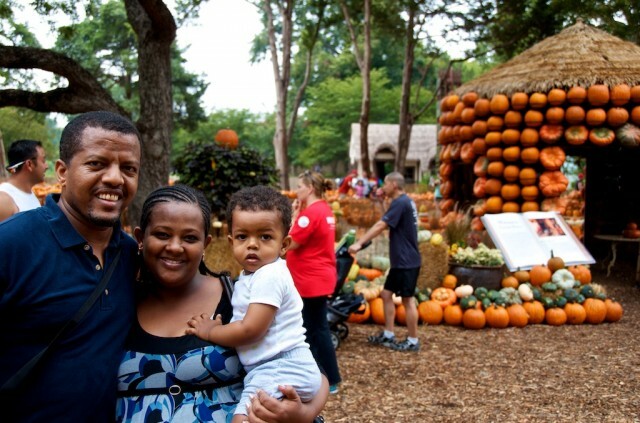 We had a great time today hanging out among the pumpkins and spending some time with our friends Yohannes, Betty, and Ebenezer! Thanks for the invite and the tickets you guys…we are blessed to call you our friends! Love pumpkin pie. I enjoy taking Ellie to the Children’s Museum of Austin. They have toddler days where the exhibits are geared towards the younger crowd. Ellie Bear has a blast. During the spring, we also take her blackberry and strawberry picking. Super messy, but loads of fun (not to mention great photos ops). 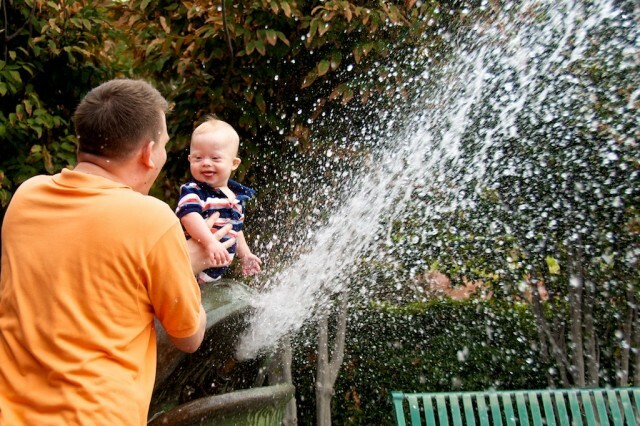 Great photos of Noah playing in the water! It looks like he was having a blast 🙂 Ebenezer does have gorgeous eyes 🙂 I am happy you were able to have a great time with your friends. And who doesn’t like the children’s museum….I know I sure do. In fact maybe we can bring Noah down to Austin some time for a play date! Loved the video. I think Noah is pretty brave! I don’t think I’ve ever seen so many pumpkins in one spot. And yes, I love pumpkin pie. This is probably the first play to explore what it means to have Down syndrome from the perspective of those who understand firsthand. Canadian playwright Judith Thompson is casting for a play that weaves together intimate stories from the lives of actors with Down syndrome. It’s likely Thompson’s is the first play to give voice to this marginalized group: studies show that over 90 per cent of people given a prenatal diagnosis of Down syndrome opt to terminate. The play – to run at Toronto’s Next Stage Festival in July – will be a montage of monologues that explores what it means to have an extra 21st chromosome. Thanks for posting the link…it looks like a great play, I wish we could attend. And we are very aware of the abortion statistic…if you look through some of my past posts you can watch some of the television interviews we have done…we have tried to mention that heartbreaking stat on every one of them. I hope and pray that all of this exposure will help put a dent in that statistic. Thanks for al you do, and keep up the great work. Your son is so adorable! 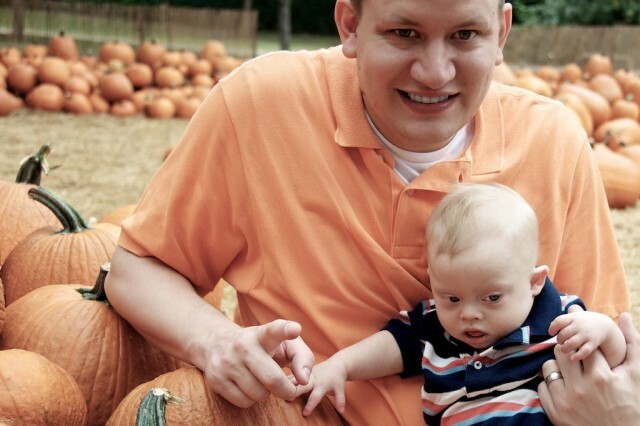 I’ve worked with children who have down’s syndrome and they are such characters! I don’t see how anyone can regard them as anything but adorable…as children all are! Thanks for your comment! I took a look at your site, and it looks like there is a lot of great info there. I can’t wait to have a look around. Where are you located? Hi — Is there a way I could mail you a copy of our magazine? It is free and we send to parents and professionals around the world. Hey thanks! That would be great! I sent you over our address this afternoon. Thanks for the offer, and we’re looking forward to checking it out. We love taking Warren to the Portland Zoo, it’s a bit far so we try and combine it with our trip to the DS Clinic there. Also in the center of our town there is this fountain that sprays water up through holes in the ground…Warren doesn’t want to get in it, but he loves watching the other kids run and squeal. The Portland Zoo sounds fun…we are huge zoo fans around here. 🙂 And the fact that you can combine it with one of your medical trips make it even better! Thanks for being such epic parents. Combine all ingredients. Press mix firmly into greased 9 inch springform pan with floured fingers. Bake at 4oo for 8 minutes. Remove and turn oven down to 350. Cream the cream cheese and sugar until fluffy. Add eggs, 1 at a time beating after each. Gradually add flour mixed with spices then pumpkin and brandy or rum. Pour into crust and bake 1 hour and 45 minutes, until center is firm to the touch. Refrigerate overnight. A trick when baking a cheesecake: Put a baking pan with water on the bottom rack when you bake it. And for a slightly less rich flavor, you can substitute ground up graham crackers for the chopped walnuts. Cute friend!! He’s adorable! You guys looked like you had so much fun. Loved the video. But the orange shirt is funny!!! And I like I said…I PROMISE that wasn’t planned. I just happened to wear an orange shirt the same day. Man…it was funny. Two weeks ago today our son was born with Down’s Syndrome. He is laying in my lap right now and is pretty much the cutest thing I have ever seen!